Thanks to the Canadian Lutheran for this story. PAT students and mentors pose with the CLTS community after morning chapel. 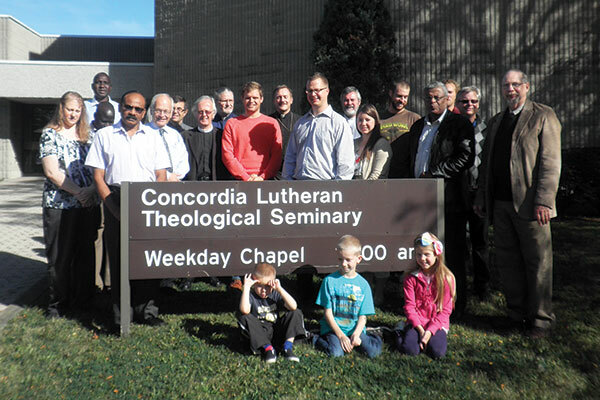 ST. CATHARINES, Ontario – The Pastors with Alternative Training (PAT) program had a special session at Concordia Lutheran Theological Seminary (CLTS) in St. Catharines, Ontario on October 2-5. Five students from diverse cultural and ethnic backgrounds took an intensive course on the Lutheran Confessions, with emphasis on the Ecumenical Creeds, the Smalcald Articles, the Treatise on the Power and Primacy of the Pope, and the Formula of Concord. The Augsburg Confession and its Apology, as well as Luther’s Catechisms, are studied in separate sessions of the program. Several reasons lay behind choosing the Lutheran Confessions as the focus for this intensive session. Some students had already taken courses on the Augsburg Confession, the Apology, and the Catechisms, while others had studied the entire Book of Concord. For these, the course served as a review. For others, however, this was their first in-depth introduction to the Lutheran Confessions. Lutheran Church–Canada (LCC) accepts Scripture as the authoritative Word of God, with the Confessions serving as faithful explications of the Scriptures. By training students in the Confessions, they are encouraged to abide in God’s Word as they carry on their missionary work. The students were taught by CLTS faculty members Rev. Drs. Tom Winger, John Stephenson, and William Mundt. During the session, PAT students had the opportunity to interact with residential students and make use of the seminary library. Students also received free theological books and were able to purchase additional books for their personal libraries. During the intensive session, students met with the PAT Committee as well as ABC District President Don Schiemann (Chairman of LCC’s Council of Presidents, which oversees the PAT program). Each student also met privately with Dr. Neitzel. In these meetings, students received a progress report on their work so far and received input on where they needed to focus in ongoing studies. The PAT Committee also had a separate meeting with the COP’s chair, during which several important matters were discussed, including reviewing the PAT Handbook, providing updating guidelines for Mentors and Instructors, and online communications.